WPAdverts Mark As Sold extension allows users and administrators to display selected ads with “sold” notification. This allows notifying visitors that the item was purchased and might be no longer available and at the same time keep the item on site. After purchasing and downloading the add-on from client panel, you can install it from wp-admin / Plugins / Add New / Upload panel. Once uploaded go to wp-admin / Classifieds / Options / Mark as Sold panel to configure it. Here you can configure what happens when a user visits an individual Advert which is marked as sold. Show ‘sold’ Notification – you can enable the ‘sold’ notification, either at the top of the Ad (above gallery) or at the bottom of the Ad below the description. Mark As Sold notification on Advert details page. If you will enable the notification at the bottom it will look exactly the same but will be displayed ad the bottom. Contact Options – You can uncheck this check box to hide all contact methods on the Advert details pages. In other words, once the Advert will be marked as sold users will no longer be able to contact the author. Top Notification Text – If you do not like the default notification text displayed at the top, you can customize it here. Bottom Notification Text – Similarly, if you do not like the notification text displayed at the bottom you can modify it here. This section allows configuring options for the [adverts_manage] shortcode. This section also has one option right now. 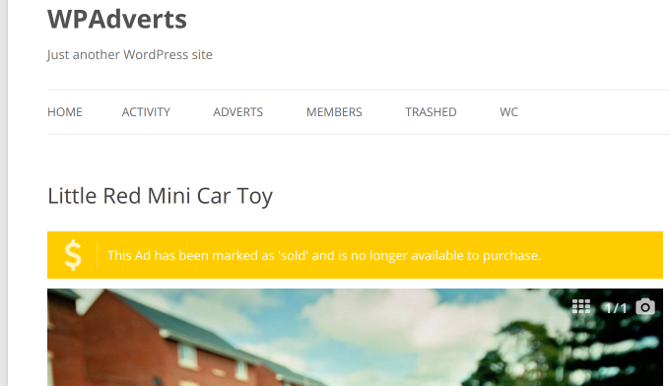 Users can mark items as ‘sold’ – by checking this item you are allowing users to mark the items as sold. Users can mark items as ‘for sale’ – by checking this item you are allowing users to mark the item as for sale again. Note you can check only one of these checkboxes. Users will be able to mark the item as sold, but will not be able to mark it as for sale again making their choice final. 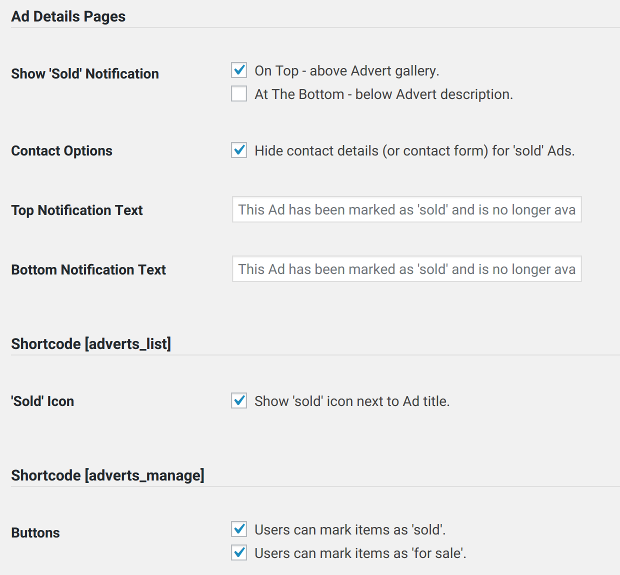 Mark as sold buttons in the [adverts_manage] shortcode. At any time administrator can change each Advert “mark as sold” status from wp-admin / Classifieds panel while editing an Advert. 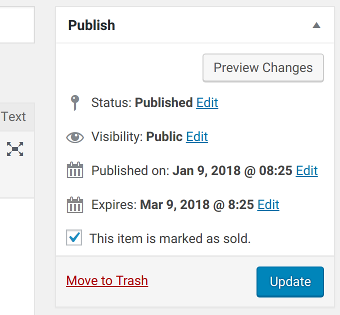 The checkbox which allows doing that will display in the right sidebar above the Publish button. Changing Advert Mark As Sold status from wp-admin panel.